Last night my husband and I decided that we were going to go into the West End and get dinner. Also, we had a £25 gift voucher for the Texas Embassy Cantina and thought it’d be a pretty cheap night. Until we got to the restaurant and it had closed down. No notice of website, or the doors/windows, it was jut shut and the restaurant was empty, no tables or chairs, nothing. So far date night was going fabulously. So we walked up Haymarket and round Piccadilly Circus and eventually settled on a 50’s style American Burger Joint, Eds diner. Great atmosphere, great food and reasonable prices! We were all set to head home when I decided I wanted dessert. 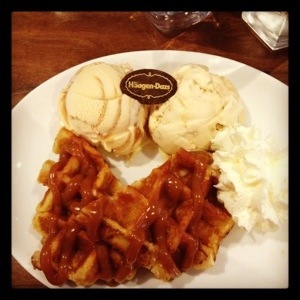 So we headed into Leicester Sq to the Häagen-Dazs restaurant. Oh yum. A restaurant dedicated to jut ice-cream desserts and drinks. And coffee. What’s not to like?!? Midway through my ice-cream I split some down my top. “oh crap!” I muttered. And quickly dipped my napkin in my water and dabbed it off. “if this was a first date, it’d have been a no” and he carried on eating his ice cream. Clearly he loves me. I think. Messiness and all.